Check out Tom’s review via the embedded player or YouTube link below. Many thanks, Tom, for sharing your review! After watching most of Tom’s video this morning while packing for YAT (Yet Another Trip–!) I thought purchasing a V-115 from Amazon might make a lot of sense. Frankly, it would be handy to have a portable that does even a mediocre job of recording shortwave to MP3 files. I did a quick search on Amazon only to discover, in the search results, that the quickest I could receive the V-115 was next Wednesday. I considered shipping it to my hotel. A bit confused, I opened the large container that holds all of the portables I use for review benchmarks. It was the only place this radio could be hiding. Inside, I discovered an unopened box containing an Audiomax SRW-710S–looking in my Amazon order history, I confirmed that the Tivdio V-115 is also badged as the Audiomax 710-S and Amazon linked the two. Then, my memory kicked in! I purchased the SRW-710S for review, but pushed it to the backburner. Then in December 2016, SWLing Post contributor, Troy Riedel, submitted a full review of the SRW-710S. Click here to read Troy’s review. After Troy’s review, I sat the 710S aside and, frankly, forgot I had even purchased it (after all, quite a few radios come into and go out of my shack!). I’ll pack the 710S and test its recording capabilities on the road this week. Tom seems to have been favorably impressed with the Tivdio V-115–perhaps the Tivdio version has had some performance tweaks? Post readers: Anyone else have a version of this radio? What are your impressions? Please comment! This entry was posted in News, Portable Radio, Reviews, Shortwave Radio, Shortwave Radio Reviews and tagged Amazon, Audiomax SRW-710S, Tivdio V-115, Tivdio V-115 Review, Tom Stiles on May 27, 2017 by Thomas. Got one a few months ago – had to wait 3 weeks to get it from China. Use it to listen to FM broadcasts and as a music player. And with a jack cable you have a great external speaker for your smartphone or laptop. And found an extra battery in an old Nokia phone I had laying around. That’s firmware problem.Need reinstall firmware.But where we download firmware? Any one give link to download Tivido v115 firmware flash file? I just got mine. All very nice, except it doesn’t read the very old 4gb microSD card I put in it. I’m hoping it’s just a card format problem. Can anyone confirm what file format works with this radio (Fat16, Fat32 etc…)? I’d much appreciate it. I am using FAT32 and it works fine. The other thing is that it may not work with older slower cards. I bought one of these to test it out and for the price paid, they are ok but mine is plagued by an inordinate amount of hash from the digital display. I’ve tried rerouting the antenna cable with thin shielded cable and put some shielding behind the board earthed to the earth points of the circuit board but to no avail. Maybe I’m asking too much from it. Anymore suggestions for quietening down the hash? 1- When I set it on Sleep Timer, pressing the Key Lock will disable the timer and the radio stays on continuously. 2- When I lock the radio the back light turns on and stays on. this drains the battery pretty quickly. Anyone else noticed similar issue and got a fix for it? Mine worked great for 3 months. Now I cannot turn it on. The “Welcome” sign comes on for about 4 seconds, then goes off. When I try to recharge the battery, the radio blinks on and off. There is no troubleshooting manual; and I don’t know how to fix this. Suggestions anyone? Probably needs a new battery. From what I have read about this brand, the life of the battery is an issue. Not sure if it is easy to replace or not. This is the corect link !!! You have some great article. Do you mind if I show your website on my YouTube show? It only accepts SD memory cards not USB memory cards. Some of their other models such as the V-116 and the HR-11S will accept both types of memory cards. See my recent reviews of these radios. The battery is very generic and is used in many cellphone so it is easy to find and not very expensive. A high quality battery will give a very long playing time. I purchased the V-115 about a week ago, and was surprised at how much radio I received for $15 plus free shipping. The FM band is quite sensitive. AM is good for locals, but not exactly a DX machine. Shortwave was iffy, but improved once I tightened the antenna mount screw (I’m used to loose screws!). Depending on location, shortwave is better, but does get some bleed from strong AM’s in the area. The audio is amazing for something of this price. I have yet to try the recording, but, this has become my go-everywhere radio as of late. The TVDIO V-115 is an amazing receiver. It was bought because I needed a small recording device for my portable SWL activities. I put a 32 GB into the slot, and found that the recordings all were of excellent quality. It also doubles as an external speaker for my FDM-DUO qrp transceiver. Not bad for a device costing less than USD 20 including p&p from China to Norway! 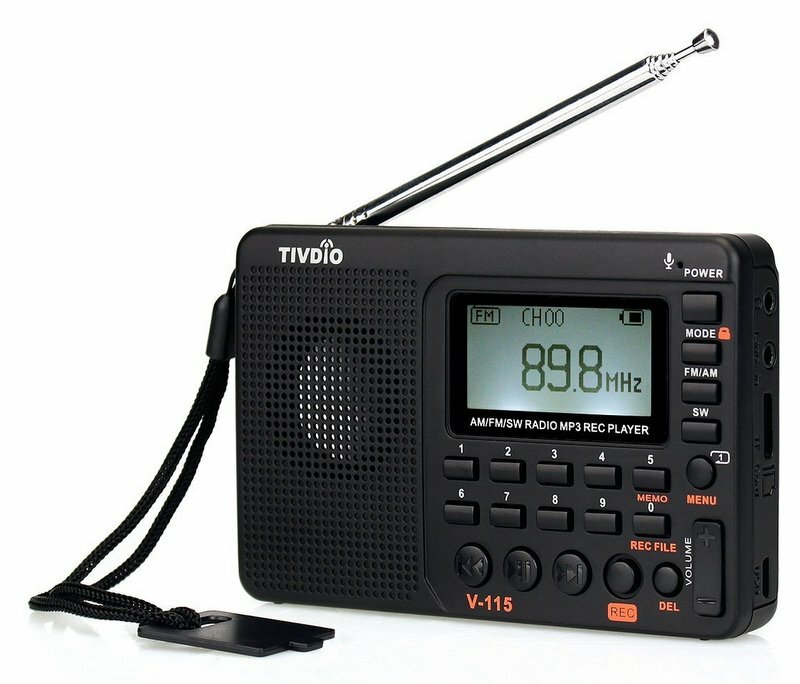 I recently purchased this TIVDIO radio. I am in Australia and it is a little beast of a machine. The speaker along with the bass is outstanding considering the size and price of the unit. Thanks heaps for a great vid. I bought two of the TIVDIO version radios several months ago. A 16GB TF card completed each one. They are, of course, re-chargeable, the sound, for the size, is excellent, the case finish is worthy of a more expensive item. Button lock, mp3 recording, auxiliary input, delete function, (including unwanted channels that the auto-tune has found), makes them a real bargain. They impress everyone who sees – and hears – them. OK, so there’s no clock or DAB, but for just over £12, including shipping from China(? ), it would be really churlish to complain. One battery charge seems to last a very long time. I ordered one of these yesterday to use for calibrating a 40 meter transceiver that I recently built. The TIVDIO V-115 was the only inexpensive radio that looked like it might do the job. All of the analog radios in the same price range seemed to truncate the bands (lopping off a little on each end). If this little guy will receive 7023-7125khz I’ll be satisfied however after reading your review it appears that it will do more than that. I own the Audiomax version of this radio. I have recorded classical music from an FM station using the Audiomax. When playing the recording on an iphone with $100 Audio Technica headpbones, the recording sounded quite good. Using the Audiomax to play recorded music off its storage card also sounds pretty good if the equalizer setting is Jazz and the headphones are expensive. While the Audiomax does not have a timer, its Auto On or Sleep function will save any recording when it turns off the radio automatically. When playing music off the storage card, the music can be listed according to artist. But the artist listing is not completely alphabetical. Radio reception for AM, FM, and SW is solid but not DX quality. When entering a frequency you have to wait about 4 seconds before the frequency changes. Also you cannot scroll to any desired frequency. The scrolling keys will skip over any frequency which does not have a significant signal. Where the Audiomax shines is that with a press of a button you can go from a boring commercial on the radio to some nice prerecorded music or podcast. For the radio alone, the Audiomax is worth its selling price. No need to wait 4 seconds when direct entering a frequency. If you hit the play button (below the 7 key) after entering it a frequency, it switches immediately. Only recently I found undocumented feature on it. 3) press the volume – down delete massage pop, confirm with PLAY. I think you have a serious problem when you buy stuff, and don’t even open it! Ha ha. Too many toys. Just kidding. keep up the good work. Somebody has to test all these radios. Thanks for the post and that is an interesting story you have. Owned one of these since January, 2017. Cost was $15.09, shipped from China, and received in 10 days. FM reception is quite good, as is the MP3 record and playback. Amazing audio quality for such a small, inexpensive item. Tactile feel of control buttons is commensurate with the price. The visual display and character size / font compare with more expensive portables. Case is not flimsy, but not overbuilt, either. Antenna rod must be purposely small to offset front-end overload on very strong SW signals. Some front end overload from the shortwave powerhouses on 4840, 9375, etc that is not present on AMBC. AMBC and shortwave signals are masked by very high internal digital noises manifested in the audio on all but the strongest stations. This is usually caused by poor internal shielding of digital circuitry or the display. Has anyone had a similar issue and had the time to investigate? I’m thinking a couple of ground points and tin shielding material can cure this, making the radio a real bargain.